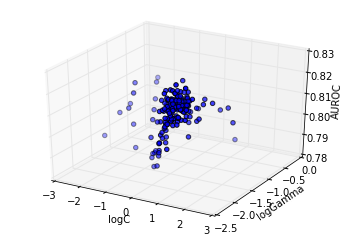 In this example we will use Optunity to optimize hyperparameters for a support vector machine classifier (SVC) in scikit-learn. 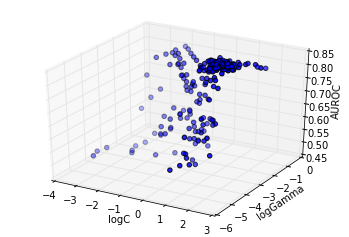 We will construct a simple toy data set to illustrate that the response surface can be highly irregular for even simple learning tasks (i.e., the response surface is non-smooth, non-convex and has many local minima). Create a 2-D toy data set. 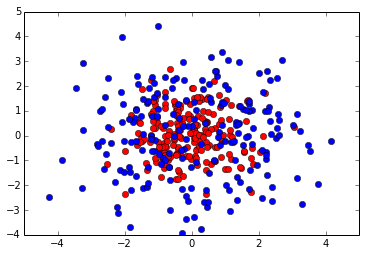 Lets have a look at our 2D data set. In order to use Optunity to optimize hyperparameters, we start by defining the objective function. We will use 5-fold cross-validated area under the ROC curve. We will regenerate folds for every iteration, which helps to minimize systematic bias originating from the fold partitioning. We start by defining the objective function svm_rbf_tuned_auroc(), which accepts \(C\) and \(\gamma\) as arguments. Now we can use Optunity to find the hyperparameters that maximize AUROC. We can turn the call log into a pandas dataframe to efficiently inspect the solver trace. 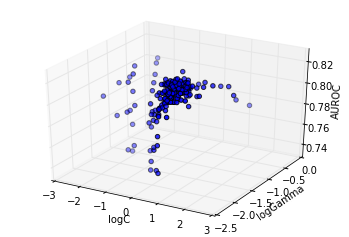 The past function evaluations indicate that the response surface is filled with local minima, caused by finite sample effects. To see this, we can make surface plots. The above plot shows the particles converge directly towards the optimum. At this granularity, the response surface appears smooth. Lets further examine the area close to the optimum, that is the 95% region. We will examine a 50x50 grid in this region. Make a new data frame of the call log for easy manipulation. Determine the region in which we will do a standard grid search to obtain contours. 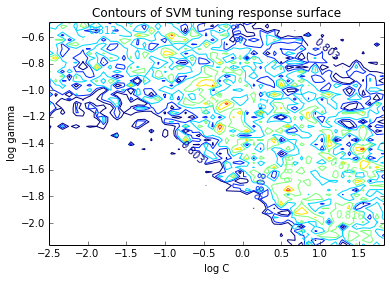 Now, lets look at a contour plot to see whether or not the response surface is smooth. Clearly, this response surface is filled with local minima. This is a general observation in automated hyperparameter optimization, and is one of the key reasons we need robust solvers. If there were no local minima, a simple gradient-descent-like solver would do the trick.